One of the most fascinating aspects of wine tasting is the way you can almost be instantaneously transported from one part of this planet to another by simply sipping a few different wines. Beam me up, Bacchus! The first taste of that lovely Italian chardonnay is like being immediately teleported to the hills of Piemonte’ where you find yourself sipping a creamy, fruit forward and exquisitely balanced white from a region more known for big reds like Barolo and Barbaresco. And moving to the next wine might take you across the world to Oregon or to South Africa. As a matter of fact, the three wines reviewed below are from those three countries I just mentioned. So many wines from so many geographically diverse regions provide us with so many opportunities to literally taste the products of a different culture. So why not invite a few friends over and conduct your own wine tasting? It’s really easy, fun, inexpensive and very educational. Whether you’re tasting all one varietal, such as cabernet sauvignon, or different types of both whites and reds, it is important to remember to taste lighter, sweeter wines first and then move on to more full bodied ones. Here is a typical example and order of a tasting of six different white and red varietals: riesling, sauvignon blanc, chardonnay, pinot noir, merlot and cabernet sauvignon. The wines are arranged from lighter to fuller bodied to prevent the stronger flavored ones from overpowering and masking the flavors the less intense wines. “Five S’s” of wine appreciation: (1) sight – observe the wine and judge its clarity, color, etc; (2) swirl- rotate the wine in the glass to unlock the flavor and aroma; (3) sniff – place your proboscis deeply into the glass and smell and try to describe what you are smelling; (4) sip – my favorite part of the tasting where you roll the wine around in your mouth allowing it to touch all the surfaces; (5) swallow – judge the impressions the wine leaves when you swallow it. Generally, a wine tasting will consist of examining five to ten wines and tasters should receive about one ounce of each wine. Ask each taster to critically examine each wine, and to render an opinion as to what they liked or disliked about a particular bottle. You can take the tasting to a whole different level by eliminating the bias of seeing the wine labels. This is known as a blind tasting and involves obscuring the wine label by having someone place the bottles in bags before you taste. This will eliminate any possible price or winery bias so that you can truly judge the product on its quality. 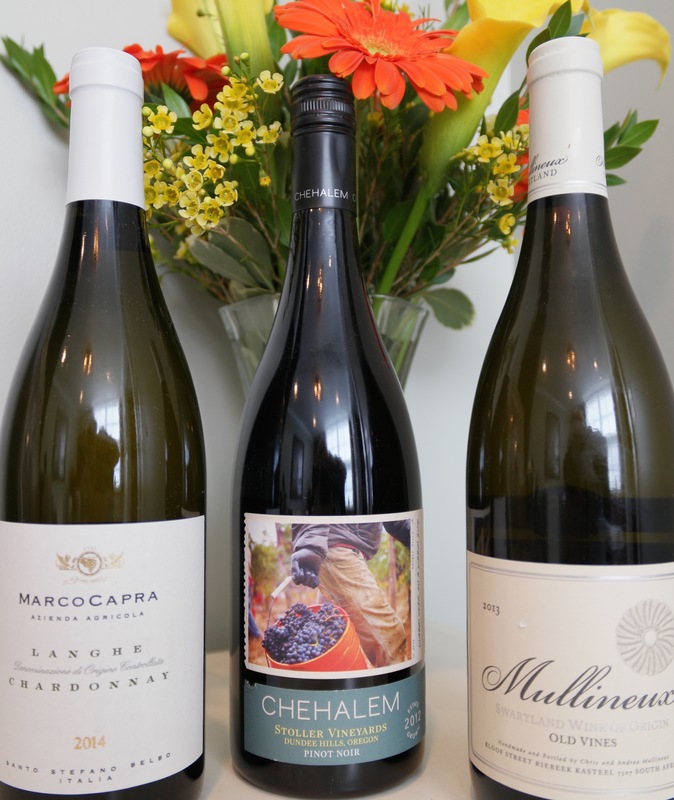 Here are three wines that were among my favorites in a recent wine tasting. You might want to give them a try. 2013 Mullineux Old Vines White Blend ($28) – An elegant South African blend of chenin blanc (80%) along with clairette blanche and viognier, this has flavors of ripe pears and melon. Rich, yet very balanced, the wine is one to pair with a whole roasted chicken that has been basted with olive oil, rosemary and a little of the Mullineux Old Vines. 2012 Chehalem Stoller Vineyards Pinot Noir ($45) – This Oregon and Willamette Valley wine is exceptional. Delicious black cherry and cola flavors and excellent balancing acidity are the highlights of this beautifully crafted example of pinot noir from a truly historic vintage. While I would lay this one down for a few years, those unable to wait should decant it for a couple of hours and then serve it with grilled wild salmon or roasted pork tenderloin. 2014 Marco Capra Chardonnay ($20) – More like a very good Pouilly Fuisse from Burgundy, the Marco Capra Chardonnay is a creamy, round yet very balanced wine with scents of anise and citrus. This wine, from the Langhe’ region of Piedmont in northwestern Italy, would make an excellent accompaniment to veal saltimbocca.